If your idea of a formula for lactation support contains Alfalfa, Anise, Barley Grass, Fennel, Fenugreek, Inositol, Citrus Bioflavonoids, Marshmallow Root, Nettle Leaf, Red Raspberry, and Spirulina, Maxi Lactation Pure & More™ is what you are looking for. For the best results take with Formula 605 at bedtime. 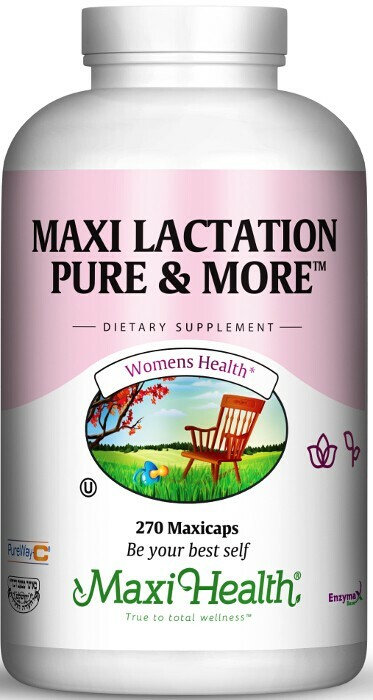 Try Maxi Lactation Pure & More™. Take 9 Maxicaps™ daily in divided doses with meals, or as directed. For best results take with Formula 605™. Enzymax®, a vital digestive enzyme complex, is a registered trademark of Maxi Health Research® LLC • PureWay-C® is a registered trademark of Innovation Laboratories, Inc. U.S. and International patents pending. It's a pleasure to have such good vitamins that helps everybody for there own needs. I take a lot of vitamins, and really feel the difference - they really work. I want to share a story with you. I'm a nursing mother and I didn't have enough milk, so I took the Maxi Lactation Pure & More and it helped me so much! I feel such a difference since I started taking it. Thank you Maxi Health for making everybody satisfied. Thanks a million! First I want to tell you that such a company like you isn't on the market. It's a pleasure to have such good vitamins that it helps everybody, me too. I'm using a lot of vitamins because it helps so good and so much. Therefore I want to share a story with you. I'm nursing a baby and I didn't have any milk so I took Maxi Lactation Pure & More and it helped me so much! And I feel such a difference. Thank you Maxi Health for making everybody satisfied. Thanks a million! First of all, a high quality company like yours, there isn't another 1 on the market. It's a pleasure to have such good vitamins that helps everybody for there own needs. I take a lot of vitamins, and really feel the difference - they really work. I want to share a story with you. I'm a nursing mother and I didn't have enough milk, so I took the Maxi Lactation Pure & More and it helped me so much! I feel such a difference since I started taking it. I wanted very much to nurse clean. I tried many supplements. Nothing helped until I started on the Maxi Lactation Pure and More. The results were amazing. I am forever grateful. Thank you. I've been taking the maxi health lactation pure and more and it's really improved my milk supply.